Ribs are a barbecue favorite. This page contains barbecued spare ribs recipes. Preheat oven to 325 degrees F. Cut pork side into ribs. Usually 2 ribs per piece. Place ribs in a pot and cover with cold water and bring to a boil. Reduce to simmer and allow to cook for approx. 1/2 hour. 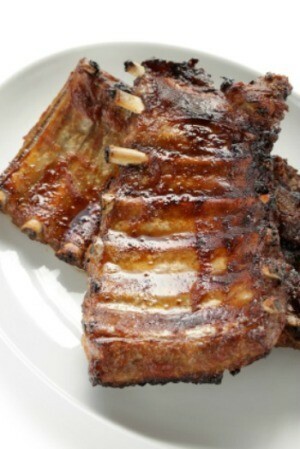 Drain and place ribs in a long and flat glass dish. Place onions and garlic over ribs and sprinkle gently with salt (or eliminate salt if using heavily spiced BBQ sauce). Completely cover all ribs with sauce of your choice. Bake uncovered for at least 1 hour. This can be ignored in the oven for much longer if you are not home if the temperature is reduced to 300 degrees F. The longer the meat cooks the more tender it will be. Note: I prefer a honey-garlic or a smoked BBQ sauce for this dish. Serve with mashed potatoes and broccoli or green beans for added colour. 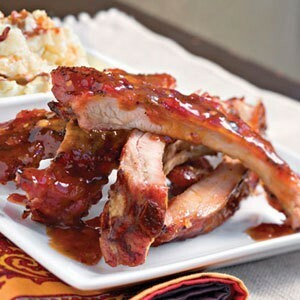 Cut spareribs in serving pieces; dredge in flour. Brown in 2 tablespoons hot fat. When browned, pour off excess fat. Blend mustard and flour to make a paste; add other ingredients and pour mixture over spareribs. Simmer all together about 20 minutes, then bake 1 hour in 300 degree F oven. My husband loves these! Any fan of barbecue will probably love this recipe! Place ribs, seasoned with salt and pepper, in roaster and top with sliced onion. Mix the remaining ingredients and pour over the ribs and onions. Cover and bake at 350 degrees F for 2 hours. Baste ribs occasionally during baking. Remove the cover for last 15 minutes so ribs can brown. In a medium saucepan, bring the ketchup, orange marmalade, tomato paste, mustard, WSS, onion, and garlic to a boil over medium-low heat and simmer, partially covered for 30 minutes, stirring occasionally. These ribs are so simple to prepare. Start them at noon or let them cook all day long for fall-off-the-bone tenderness. If anyone has a recipe for barbecued spareribs, I would love to have it. If it isn't too much trouble can you tell me all steps involved, as I am not very experienced with chicken or ribs. I usually just cooks burgers and hot dogs. Thanks a lot for any advice and recipes! I found this to be very easy and the ribs are nice and tender. Put the ribs in the oven on about 400 for 1/2 hr. uncovered. After the 1/2 hour I than cover with foil and bring the temp. down to 250 for about 1 1/2 to 2 hours. Than you can either do one of the following. I use Sweet Baby Rays Sauce or whatever you prefer pour on and leave uncovered for about 1/2 hr. OR I put them in the fridge for the next day for grilling. Piece of foil on the grill with holes for venting purposes. Pour some sauce on them and let them heat up for about 20 mins or until them seem hot. You are ready and they are nice and tender falling right off the bone. Hope this works for you as well as it does for me. Good Luck. This marinade makes the ribs very tender and tasty. Enjoy! You can also go to foodnetwork.com and get lots of recipes and ideas there. My husband and son use that site a lot. Emeril has a great rub you put on first (set overnight) and then a bbq sauce during smoking/grilling. They are very good. Type in spare ribs and the one for smoked bbq ribs is the one we have tried. Different parts of the country use different methods for barbecue, but to me the smoke is the thing. I usually use a marinade based on vinegar, mustard, peppers and garlic, with anything else that sounds good at the time. If you don't have time to marinate it just add a can (or more, depending on how much you're making) of beer to the mix and parboil the meat very briefly. Then slow-grill using your choice of flavor wood. I prefer hickory for pork, but sometimes use various combinations of fruitwoods. I avoid mesquite on pork; it's great for beef and okay for chicken but IMO it just doesn't work on pork. Here is a link to a Kansas City Style Ribs recipe that is excellent. Enjoy! Does anyone have a good recipe for "Dry Garlic Spareribs"? Marinade at least 4 hours, preferably overnight. Bake 400deg. for @ 30-45 min depending on the size of the ribs. Thank you so much to you all for the recipes! they all sound really good,I hope to try them all Barbara. I am looking for recipe for spareribs made with coke. It was great and tasted just like from a Chinese restaurant. I have used Coke, Pepsi, Dr. Pepper, Faygo Rock n Rye. I have also used the diet versions of all these and it made no difference. I usually soak my ribs for several hours in a mix of the pop, chopped garlic, salt, freshly ground pepper and whatever else I feel like. Then I grill the ribs. I mix premade BBQ sauce with the marinating liquid (1/4 marinade to 3/4 BBQ sauce) and baste. To serve I boil some of the remaining pop and mix with more BBQ sauce. My husband and I love Emeril's Kicked Up BBQ, Sweet Baby Ray's and Sticky Fingers. Mix all ingredients in a saucepan and bring to a boil. Reduce heat and cook slowly for 1-2 hours, stirring occasionally. Let cool. Place the ribs in a glass baking dish and pour Coca Cola BBQ sauce all over, cover, place in fridge and let marinade overnight. Sprinkle with Cajun seasoning and slow cook in the oven 3 to 4 hours at about 300 or grill over indirect heat. Brown ribs on both sides in shortening in Dutch oven. Brown onion in butter in skillet. Add remaining ingredients and 1 cup water to onion, heating until very hot. Pour over ribs. Bake at 375 degrees F for 1 3/4 hours.